That we may understonde what ye seye (cited in Cutts 1995:4). Therefore, it can be argued that the primary function of any language is to allow for communication. In terms of practicality, clear and simple language is far more efficient than a flamboyant or excessive equivalent regardless of technical correctness (Plain English Campaign 1993). The founder of the Plain English Campaign, Chrissie Mayer, identified the fatal extent of poor and confusing communication whereby two elderly ladies had died. They developed hyperthermia as a result of not being able to correctly complete a benefits form due to its complicated language (Plain English Campaign 1993). Plain English means tailoring the language appropriately in order to help people extract the meaning of a message without having to read through it more than once (Cutts 1995: 3). However, this does not mean patronising the reader with simple words akin to those used for communicating with primary school children (Plain English Campaign 2008). 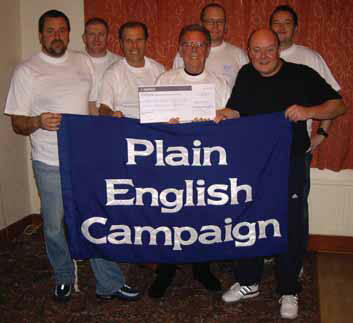 In summary, Plain English is defined as ‘a message, written with the reader in mind and with the right tone of voice, that is clear and concise’ (Plain English Campaign 2008). For this evaluation, I shall be examining the advice given in ‘How To Write In Plain English’ (Plain English Campaign 2008). With regard to structure, the campaign advises that a body of writing should consist of mixed length sentences to give an average sentence length of fifteen to twenty words (Plain English Campaign 2008). Cutts (1995) agrees with these guidelines; however he acknowledges that The Plain English Campaign’s advice is not a quick fix. Writing to a good standard will still prove to be a laborious challenge but, if the writer adheres to the campaign’s advice, the product of their effort will be something readers are more likely to understand. Ultimately, the communicative meaning should be the writer’s priority; even if it means exceeding the recommended sentence length average.